Every so often a video circulates Facebook of Royal Blue Boon ridden by Larry Reeder in the 1995 Masters with a score of 225. Every time it comes around, I watch it and think of all the good that mare, bred to Peppy San Badger, did for the cutting industry with their colt, Peptoboonsmal. I have a grandson of his out of Wendy Woldt’s Strawberry Boon, and he’s a fine young horse. 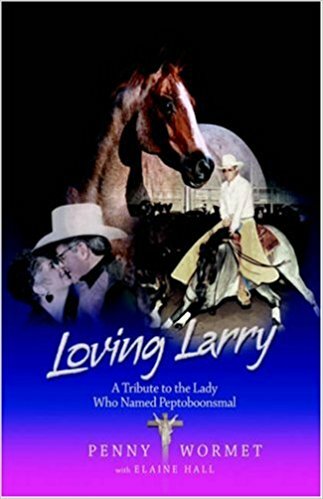 A hidden gem containing a wealth of information about Peptoboonsmal’s breeding is Loving Larry, written my Penny Wormet and Elaine Hall, about Elaine’s life with and marriage to Larry Hall. I don’t care to divulge too much of the story contained in the pages—I’d rather you read it yourself—and I encourage you to get a copy if you or a friend has interests in any of the following: cutting or equine sports in general, horse breeding, marriage tribulations, or a love of the almighty God. Larry and Elaine’s relationship was rocky and rough, but their love for each other and God is a lesson to us all. They worked hard to create a loving home and raise the finest Quarter Horses they could, but it wasn’t easy by any stretch of the imagination. Larry fought an internal struggle that affected his whole family. I purchased by copy here, you can learn more about Peptoboonsmal here and here, and to learn about Royal Blue Boon, read the book. It’s contains a lovely life story of the amazing mare.